This article is about the year 1266. Wikimedia Commons has media related to 1266. 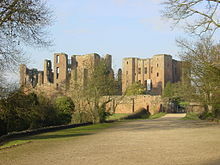 Kenilworth Castle, whence besieged followers of Simon de Montfort issue the Dictum of Kenilworth in 1266, seeking peace with the king of England. Year 1266 (MCCLXVI) was a common year starting on Friday (link will display the full calendar) of the Julian calendar. February 26 – Battle of Benevento: The army of Charles, Count of Anjou, defeats a combined German and Sicilian force led by King Manfred of Sicily. Manfred is killed in the battle, and Pope Clement IV invests Charles as king of Sicily and Naples. June 23 – War of Saint Sabas: In the Battle of Trapani, the Venetians defeat a larger Genoese fleet, capturing all its ships. July – Mary de Ferrers is ordered to surrender land and Liverpool Castle to Edmund, second son of Henry III. October – In England, the Second Barons' War winds down, as supporters of the slain rebel leader Simon de Montfort make an offer of peace to the king, in the Dictum of Kenilworth; after slight modifications to the peace settlement, it is agreed to the following year. The war between Scotland and Norway ends, as King Alexander III of Scotland and King Magnus VI of Norway agree to the Treaty of Perth, which cedes the Western Isles and Isle of Man to Scotland, in exchange for 4000 merks. Niccolo and Maffeo Polo, father and uncle of Marco Polo, reach Kublai Khan's capital Khanbaliq (now Beijing) in China, setting the stage for Marco's famous expedition 5 years later. Kublai Khan sends the Polos back with a message, requesting that the Pope dispatch western scholars to teach in the Mongol Empire; however, this request is largely ignored. In today's United States, a period of drought begins in the Four Corners Region (this period was up until a year 1299), putting end to the ancient Puebloans Civilization. Ode de Pougy, Abbess of Notre Dame aux Nonnains, sends a gang to attempt to destroy the nearly-completed Church of St Urbain, Troyes. ^ "When Hebrideans were offered a new start in Norway". Scotsman. Retrieved April 27, 2018. ^ "Manfred - king of Sicily". Encyclopedia Britannica. Retrieved April 27, 2018. ^ "Malcolm (II), earl of Fife (d.1266)". db.poms.ac.uk. Retrieved April 27, 2018.